They love Twitter, but they also have a business blog. 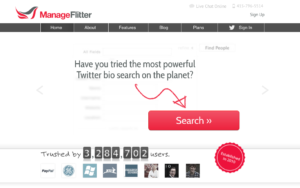 I’m not a user of ManageFlitter, but it looks like a very intriguing tool. It looks like some of the main features with ManageFlitter are that you can really dig into the profiles and people on Twitter. If you’re looking to follow people that are likely to follow you back you can learn that information and be more strategic with who you follow and who you engage with. Twitter remains one of the biggest social networks. I use it to gather news and updates throughout the day. I use it to subscribe to feeds and blogs so I know when there is new content. Now Twitter is even going to stream NFL games. They’re doing a lot of good things and a lot of people are using it and that’s why marketers have also been drawn to the platform. And ManageFlitter is giving those marketers the information they need to use their time effectively on the social network. You can learn more about ManageFlitter on their website, but right now we’re going to check out what they’re doing with their blog strategy. Just a quick note here – you’ll notice that ManageFlitter has their blog right in the top navigation on their website. To me, that says that they really believe in the power of a blog strategy for a business website. Okay…maybe that’s overstating things. It could just be that a lot of companies include the link to their blog in the main navigation, but either way it’s still a decision to show people where your blog is on your website. Usually I look at a blog post as the first entry to your website. Usually someone will find a post of yours on Google or social media or somewhere similar and it will be the first time they’ve been on your website. Then once they get to the homepage or wherever from there you’re usually wanting to keep them moving through your sales process and not back to the blog. But putting the blog link in the main navigation is still a good thing. It’s not the main call to action, but it’s there when people want to find it. Right at the top of the blog and on each post you’ll see a red bar with a call to action. I will all this a subtle call to action. It actually stands out just the right amount. You notice it right away, read it and then can determine if it’s time to take action or keep reading. It’s a simple action request to try ManageFlitter for free. It’s a good call to action. They lead into it well by telling readers that they can do more with Twitter by using the app. You want subtle calls to action on blogs. It’s usually the first time the person has been on your website. You don’t want to be too forward right away, but you do want them to know your intentions. I like the way that ManageFlitter has used this call to action on their blog. Not too much, but you do notice it and it makes you think about taking action. And even if you don’t act right now you’ll likely remember it when you are in the market for such an app. Sometimes it’s good, even for businesses, to mix things up with a fun list post. ManageFlitter had one of their interns create a cool list post about some funny tweets from Brazil. These posts can be great from time to time for getting some engagement. They entertain people. They make people laugh and it’s good to have laughter in life. Not every post needs to be a story or a how-to post or answering a question. You probably want most posts to be in that vein, but it’s good to mix things up once in a while so I always like seeing fun posts on business blogs. And one question I get from time to time from businesses is how they can inject personality into their branding and by sharing some fun posts on your website is one good way to do that. 4. Instagram? What’s That Doing Here? Here is a recent post on the ManageFlitter blog…that’s about Instagram? Why would they write about Instagram? Aren’t they a company that helps people with Twitter? First, the post is really good. There are some great examples included. it’s a longer post with tons of good, actionable information that you can use to get more engagement as a user or marketer on Instagram. Second, it’s okay to branch out into related areas with your business blog. ManageFlitter writes plenty about Twitter and they’ll probably have a lot of posts in the future on Twitter, but that’s not the only thing that their target customers care about. In the B2B world I like to look at business blogging as writing about the things that affect your target customer’s job. They want to do well at their job. They have questions about their job. If you can answer those questions you’ll be very valuable to them and you’ll still be attracting the right person to your blog and website. So in this case the person that might use ManageFlitter is probably a social media manager. They probably think about Twitter some of the time, but they probably also think about other social channels and thus it makes sense to write a great post about Instagram. This is a cool post. It’s cool for ManageFlitter because they can kind of recap things that happened on Twitter in the past year. Lots of cool things happen on Twitter, but usually there are some interesting things that happen in most industries. And this is a great type of post that you can create on your own business blog. You can recap the important things in your industry from the last year, but many companies do recaps every month or even every week. It depends on the industry. But these posts are great to kind of keep up your frequency. It’s one post every year that you can do without having to stress over a title for a post. you could do it every month and then include it in an email newsletter to your clients and subscribers. I like a lot of the things that ManageFlitter is doing with their business blog. I don’t know too much about their app, but I might have to check it out because it looks very useful. And I love using Twitter so I think it would be a fit for me. And on their blog strategy I think they’re doing well. I think they’re busy so maybe they don’t have as much time to blog more often, but they’re sticking with it and doing some good things. It’s another good example of a business using a blog to attract target customers.